Disney showcased their entire upcoming live-action movie slate at D23 this weekend and they didn't disappoint. They brought out the big guns with A Wrinkle in Time, Mary Poppins Returns, Avengers: Infinity War and Star Wars: The Last Jedi. But they also had time to give us some details on a new project in the form of The Nutcracker and the Four Realms, which will be a new take on the classic Christmas tale. Disney has set the movie for a November 2, 2018, release date and they even showed some early footage. Unfortunately, Disney didn't release the footage online, but the cast is top-notch. The Sugar Plum Fairy will be played by Keira Knightley, Mother Ginger will be played by Helen Mirren, and Drosselmeyer will be played by Morgan Freeman, with ballerina Misty Copeland also set to star. The Mouse King is going to be a CG creation, with Charles Riley, aka "Lil Buck," providing the motion capture. Per Slash Film, here is a description of the footage from Nutcracker and the Four Realms that debuted at D23. "The trailer we saw opens with a carriage moving through the snow, while the instantly recognizable voice of Morgan Freeman narrates that it is Christmas Eve, a time of mystery. We then see an elaborate Christmas party, with a young girl wandering through the house, following a strange thread. Eventually, her path leads her into a snow-covered land, fantastic and over-the-the-top in its design. There are a lot of patterns in this world and it looks, for better or worse, very similar to Tim Burton's Alice in Wonderland remake." The Nutcracker story debuted in 1892 and comes from the mind of author E.T.A. Hoffmann. The original story follows a young girl named Clara who, on Christmas Eve, receives a bounty of gifts from her toymaker godfather. Among these toys is a wooden nutcracker shaped like a man. When Clara goes to check on her new toy later that night, the clock strikes twelve and, in classic fairytale fashion, the nutcracker grows to life size. Clara then finds herself in the middle of a battle between gingerbread men and mice. The Nutcracker is one of the world's most famous ballets, but it has never been given the big screen treatment in the way that Disney seems to be doing here. Lasse Hallstrom (Chocolat, A Dog's Purpose) is directing Nutcracker and the Four Realms for Disney with Ashleigh Powell writing the screenplay. And, in case you were wondering, the four realms that will be visited in the movie consist of The Land of Flowers, The Land of Snowflakes, The Land of Sweets and the fourth realm, which belongs to the Mother Ginger (Helen Mirren). 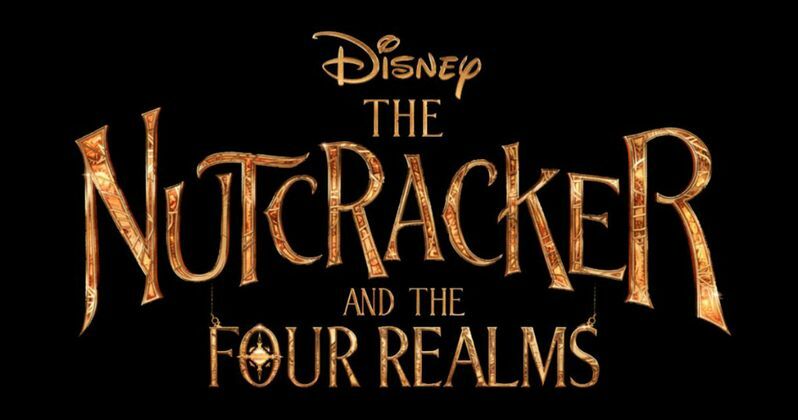 To help fill the void until Disney decides to release the footage, you can check out the first logo for Nutcracker and the Four Realms for yourself below.